igital assistant apps of all kinds are on the rise, but you don’t necessarily need to invest in a smart speaker to start chatting to one: with a little know-how you can get Amazon Alexa or Google Assistant up and running on your computer. Here’s what you need to do. If you suddenly find yourself taken with the idea of chatting to bots on your laptop, then remember you can fire up either Cortana on Windows or Siri on macOS for a little conversation. 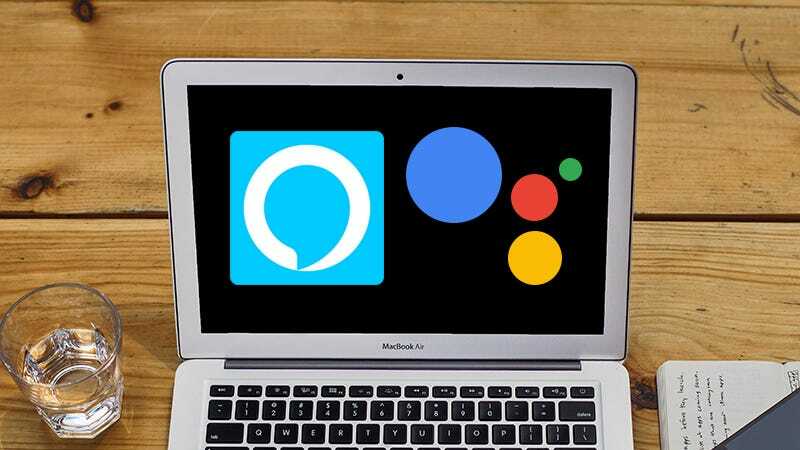 What’s more, it’s likely only a matter of time before Google’s digital assistant comes to Chrome and Chrome OS, but it’s not there yet. Firing up Alexa on an Echo or the Google Assistant on Google Home (or an iPhone) are easier routes for anyone wanting to get answers, calendar update,s and restaurant recommendations with their voice. It requires a few minutes of hassle to get the assistants running on a computer, but that doesn’t mean it’s not worth it. Maybe you’ve got an Amazon Echo installed downstairs but you’ve only got your laptop upstairs; or maybe you’re away from home altogether and pining for some interaction with Alexa. There are quite a few reasons why you would want to set this up and the desktop apps sync neatly with your existing accounts, so all your stuff is still available. Our Google Assistant hack is a little more time-consuming, but again, it allows you to test out what Google believes is the future of interaction right from the standard laptop or desktop you already own—and then you can decide if it’s worth splurging on a Pixel. Oh, and you can maybe impress the geekiest of your friends, too. Amazon has actually released a web interface for Alexa, which you can find here. Sign in with your Amazon credentials to access it, and if you own an Echo at home, then you’ll find the screen populated with all your information and recent searches. You can’t use this screen to interact with Alexa, though. You can, however, interact with Echosim.io, a skills testing ground for the web built by Amazon. The web app is aimed at developers but available to anyone with an Amazon account. Once you login, accept the terms and conditions, and grant your web browser access to your microphone, you can start interacting. Click and hold the microphone button or hold the Space bar on your keyboard to start chatting (no need to say “Alexa” here). As you’re using your Amazon account, everything you’ve set up with your Echo—from calendars to shopping lists—can be accessed, and all your queries go into your main Alexa history too. Any of the skills you can use with an Echo you can use with Echosim.io, though, obviously some require extra setup in the Alexa app, so you can’t start ordering Ubers and pizzas straight off the bat. One or two skills we tried seemed to get confused that they were sitting in a web browser, but generally speaking everything runs smoothly.